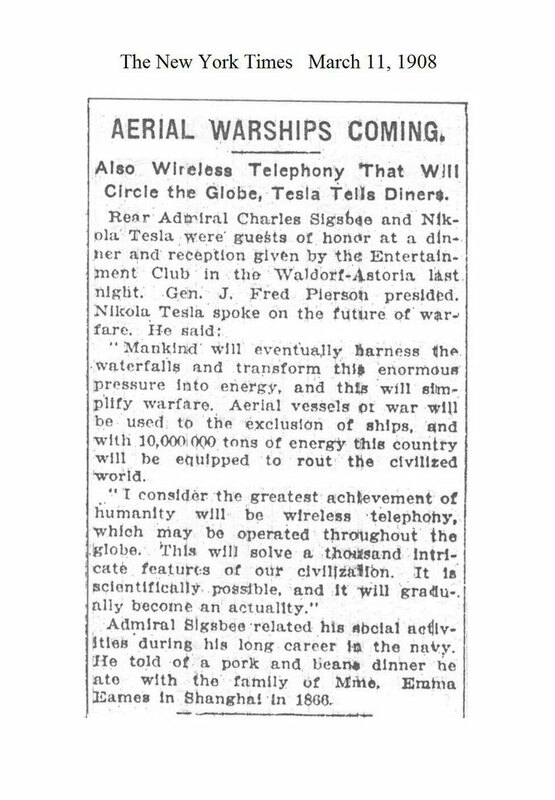 The New York Times March 11, 1908 AERIAL WARSHIPS COMING. Also Wlreleu Telephany ‘That Wlll Clrcle the Globe, Tesla Tells Dineri. Rear Admiral Charles Slgabqe and Nik- ola' Tesla were' guelsts or honnr at :1 dln- ner a,nd‘ reception given by the Entertain- ment Club ln tho Waldorf-Astoria IAM nlgllt. Gen. J. Fred Plersoh presldlzd. Nlkolu Tesldspoke on the future of' wan fare-_ He mild: “Mankind wlll eventually harness the waterfalls and transform £hl| enormous' prvssure into energy, and this 'will slim-_ pllfy warfare, Aerlnl vessels or war will be used to the excluslon of ships, and with 10,00(\:000 tnns ot energy tlhls couniry will be equipped to routl the clvlllzed world. __" I consldér 'the greatest achievement of humanity wlll- be wireless iélephohy, which may be operated throughout iho globe. This will solve a thculsmnd lntrl-» caté fcaiurtfs of our clvllliallllbn. It in sclnntltlcnlly. possible. and lt wlll gradlu-, nlly become an actuality." ` Adrnlrul Slgsbeo'relntod_hls nuclal aolllv- Itlsa during hls long career ln the navy. Ile told of a pork and Beano dlnner he mo wlth the' tnmlly of Mlrhe. Emma Eames ln Shanghalnln 1866.